Wire wrapping is great, but are you ready to go beyond that? 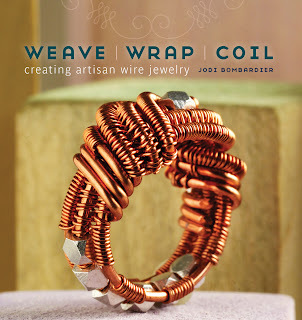 Wire lovers of all skill levels will have something to cheer about with Weave Wrap Coil, written by Jodi Bombardier and published by Interweave Press. Even if you are a complete beginner, Jodi's book has a good fundamentals and techniques section that will bring you up to speed. After some practice with inexpensive wire, you'll be ready to pick from many beautiful projects. There are three main sections to the book. The first covers Beginner Projects, nine in all. They are strikingly beautiful, and will let you practice and master the basics. The second section has the Intermediate Projects, where my very favorite piece in the whole book resides. 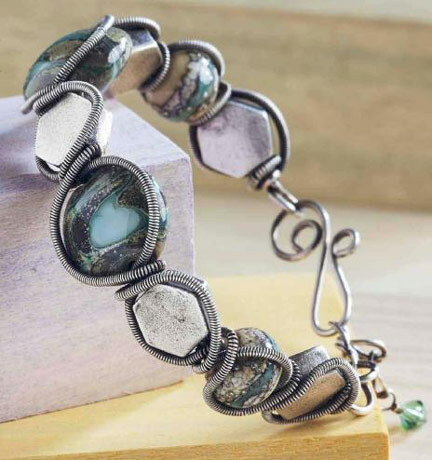 It's called the Sublime Dreams Bracelet, and is pictured below. For these projects, you'll need some experience with basic weaving and coiling, which of course you can get by mastering the Beginner Projects! The third section has the Advanced Projects. Unless you have a lot of experience, you will not be able to figure these out without carefully reading the directions. And probably getting some more practice! Would you like to win a free copy of this book? Here's what you need to do...please read this carefully. Leave me a comment here and include your email address. If I don't see your email address, I won't be able to contact you. No contact, no win, and I simply have to go on to the next person. You are welcome to spell it out if you'd prefer, for example, cyndi at mazeltovjewelry dot com. If you tweet or post on Facebook or other social spots about the contest, you can leave a second comment and be entered twice! Deadline: May 15, 2013. Hadn't seen this book. Looks great. Would love to win it. Just tweeted about your review and giveaway. I've been considering buying this book for years so I would love to win it! Pretty please count me in for this amazing giveaway! Thanks a bunch! Oh WOW! This book looks wonderful and it is just what I have wanted to do. That ring looks like so much fun to make and wear. What an amazing looking book. Would absolutely love to give it a try. I really want to improve my wire skills, and with 9 beginner projects, it sounds like this is the right book to help. Thanks for the giveaway! This is a fantastic giveaway and my daughter and her daughter would just love it. They do so many crafts together. This books looks very intriguing definitly worth having in my collection. Oh I would love to give this book a good home!